It is thought that the pyramid of Queen Khentkaus II (of the fifth dynasty, Old Kingdom) at Abusir was initially constructed as the satellite pyramid in the pyramid complex of Neferirkare was adapted to become her burial site. Graffiti on a block of her pyramid names Khentkaus (Khentkawes) as “King’s Wife” and indicates that work on this pyramid was halted during the tenth year of the reign of an unnamed pharaoh. It is likely that this was due to the death of her husband Neferirkare. Some time later construction is restarted, but this time Khentkaus is described as “King’s Mother”. It is generally agreed that her burial was completed by one of her sons (Neferefre or Niuserre) but it is also proposed that she may have ordered the resumption of work herself while acting as regent for one of her young sons. The pyramid has a base of around twenty-five meters and was around seventeen meters high. It was composed of three layers of limestone bound with clay mortar and clad in high quality limestone with a dark gray granite pyramidion. A pile of rubble around four meters high is all that remains of the edifice now. From the entrance in the north face a limestone clad passageway descends to a horizontal corridor with a single portcullis block just before the entrance to the burial chamber. The burial chamber is also clad with limestone and has a flat limestone ceiling. Fragments of a pink granite sarcophagus and mummy wrappings were discovered here along with fragments of stone vessels inscribed with her name. The original plan was that the pyramid complex would be surrounded by a large limestone enclosure wall. However, construction of this wall halted when the complex was enlarged (probably to reflect the enhanced status of Khentkaus II)and the limestone blocks were recycled to build a cult pyramid at the south east corner of the complex and to extend the mortuary temple. The mortuary temple to the east of the pyramid seems to have been built in two stages. The oldest part of the mortuary temple was composed of limestone while the later additions to the mortuary temple were built in mudbrick. Two large limestone pillars painted red and inscribed with Khentkaus’s name flanked the original entrance. This entrance led to a pillared portico but very little of this structure remains. Behind this was an open courtyard leading to the western part of the temple and a small chamber with three niches which probably held statues of Khentkaus. The courtyard featured several square pillars painted red and inscribed with her name and titles. There was also a small sanctuary clad in limestone with an altar, a granite false door. A stairway led to the roof of the temple, perhaps to allow astronomical rituals to be performed. A relief in the courtyard depicts Khentkaus seated on a throne holding a papyrus scepter and wearing the uraeus. Some experts have suggested that this dose not confirm her as a ruler (as would usually be the case) but served some other function. However, in this temple she is described as “Mother of the Two Kings of Upper and Lower Egypt” but also as “King of Upper and Lower Egypt and Mother of the King of Upper and Lower Egypt”. 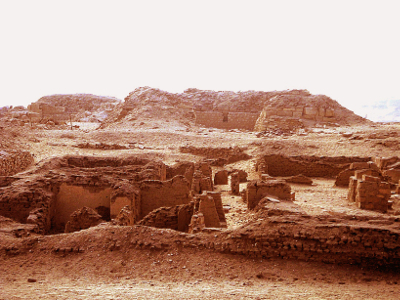 A sizeable collection of papyrus (part of the “Abusir papyrus”) was found in this mortuary temple which has provided invaluable information about the functioning of the mortuary cults of Abusir’s necropolis. A large number of fragments of Egyptian Blue faience inlays and tablets were also recovered from her mortuary temple. There are two recurrent themes to these decorations: a band with containing the titles of Khentkaus and a floral rosette which is similar in appearance to one found in the mortuary temple of Sahure. It is thought that these fragments decorated wooden shrines which held statues of Khentkaus II. 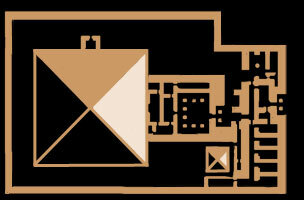 To the south corner of her pyramid complex there is a small satellite pyramid with its own enclosure wall. This would appear to be the first time that a queen had been given a cult pyramid as part of their burial and so some experts have suggested that this strengthens the case for considering Khentkaus as a ruler in her own right and not just the wife of the King.